Introducing the new Sugar Plum Collection!! But a holiday collection wouldn't be complete without GIFTS...or better yet, a giveaway!! Scroll down to find out the details on how you could win. Hello Doodlebugs! It's Mendi here today and I was so excited to be assigned the task of creating Christmas cards with the new Sugarplums collection. I absolutely love sending handmade cards to my friends & family and several of the designs I am sharing today would be really easy to make multiples of. To make it reasonable to create multiples, I focused on embellishing my cards with the darling 4x4 and 4x6 scenes from the Christmas Magic and Merry Magic patterned paper. These are wonderful for cutting apart and using as the focal point of a card. So many of the designs I am sharing could easily have the images swapped out to make use of all the pieces on the sheet. As you can see many of my cards have a patchwork theme. I love finding ways to incorporate all the beautiful patterns in a collection and my first card does this using circles. I have created a free cutting file which you can download HERE for the card base (as well as for cutting out the patterned paper circles if you don't have the right sized circle punch handy. I embellished with a gingerbread doodle pop and some heart and candy sprinkles. I finished off my card with a sentiment stamp by Lawn Fawn. My second card uses the patchwork theme in the form of layered scalloped borders which I die-cut using Doodlebug's Eyelet Lace & Scallops Sizzlits Decorative Strip die by Sizzix. I heat embossed my sentiment onto a small die-cut tag which I tied on with Ladybug twine and topped with a gumdrop sprinkle. To lend a bit more interest to my card I decorated the ornaments on the tree by layering them with Doodlebug's glitter sprinkles. Up next I have a card which uses a triangle banner die to create a patchwork borders above and below the sentiment cut from the 6x4 card. 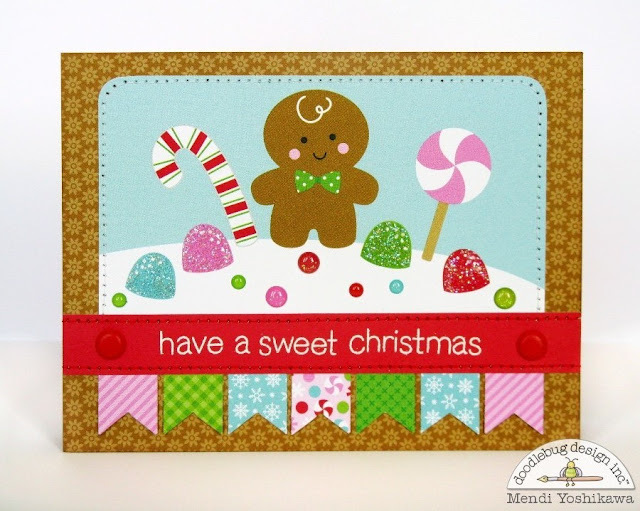 I finished off my card with a simple machine stitched border and a couple of gingerbread icon stickers popped up with foam tape. My next card makes use of leftover paper strips to form my patchwork background. To give my card some texture I stitched to the right of each strip and then topped it with the 4x4 Mr. & Mrs. Claus card which I trimmed down just a wee bit to allow more of the background to peek through. Once again I dressed up my card with some candy and heart sprinkles and heat embossed my sentiment onto an office metal rimmed tag. For this card I trimmed down the 6x4 scene to fit onto my A2 card front with a small border of Bon Bon Petite Prints peeking through for my background. I then cut small fishtail banners to form my patchwork pattern along the bottom. To give my gumdrops a realistic feel, I coated them with Stardust Stickles and layered the dots in the icing with Doodlebug Sprinkles. I completed my card by heat embossing a Lawn Fawn Sentiment on red paper from the 6x6 pad and topped with Doodlebugs chunky brads. For my last card, I used a circle punch to cut out the 4x4 card and layered it over a scalloped die-cut which I cut from coordinating patterned paper. I once again used sprinkles to dress up my trees and heat embossed a lawn fawn sentiment over a die-cut banner. Are you still with me? ;) I hope I've inspired you to pull out this darling collection and get a jump start on your own Christmas cards. These adorable papers are guaranteed to make any recipient smile. We are giving away some amazing boxes filled with an assortment of our new Sugar Plum Collection SIX lucky winners. The more you enter the more chances you have to win!! You will have until Thursday, Oct. 15th at 11:59pm MST to enter. We'll post the winners that following week. Good luck!! So cute! Happy to follow on Instagram! Love your collection of cards, Mendi!! So cute and festive! These cards are so cute! I pinned. 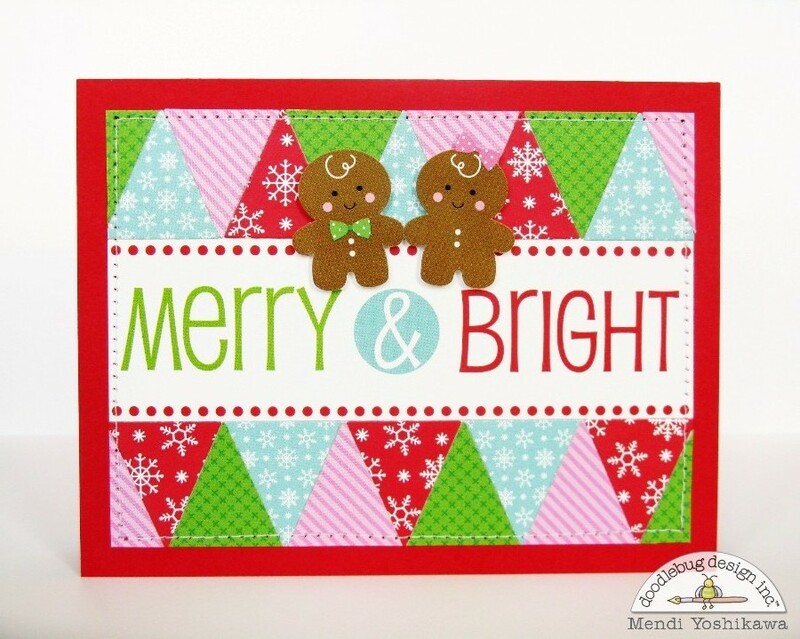 I pinned the fun Merry& Bright card. 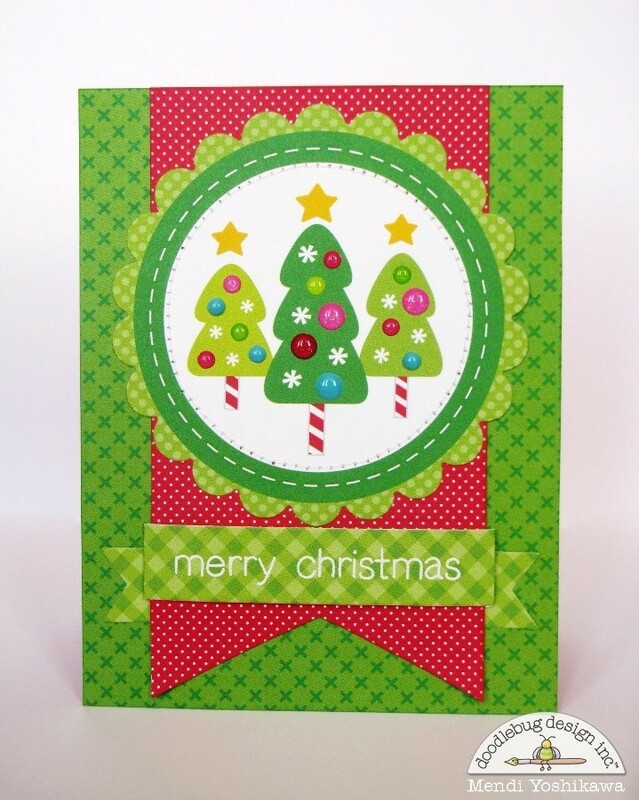 I pinned the cute Merry Christmas tree card. i love this collection its so cute!!!!!! ive pinned a few as i cant get enough of this collection!!! So super cute! Each one is just so cheery!! OMG Your cards are absolutely Adorable....Gosh you did a super outstanding creative job....hope you made a set for yourself and strung them on a long ribbon to create the cutest Christmas Banner ever....I love them all....the People on your Christmas List are all in for the Christmas Treat of their life...and bet your cards end up being placed on their Christmas Tree and saved for next year....the year after and so on. YOU so ROCK!! I am off to get this collection for my December Daily!! Beautiful cards. Pinned the card with the Christmas trees. Love it. Shared today's post on Facebook. Love these gorgeous cards, each design is so unique and fun! I pinned each of these cards! Also shared today's post on FB! I pinned 4 photos in my christmas crafts board. 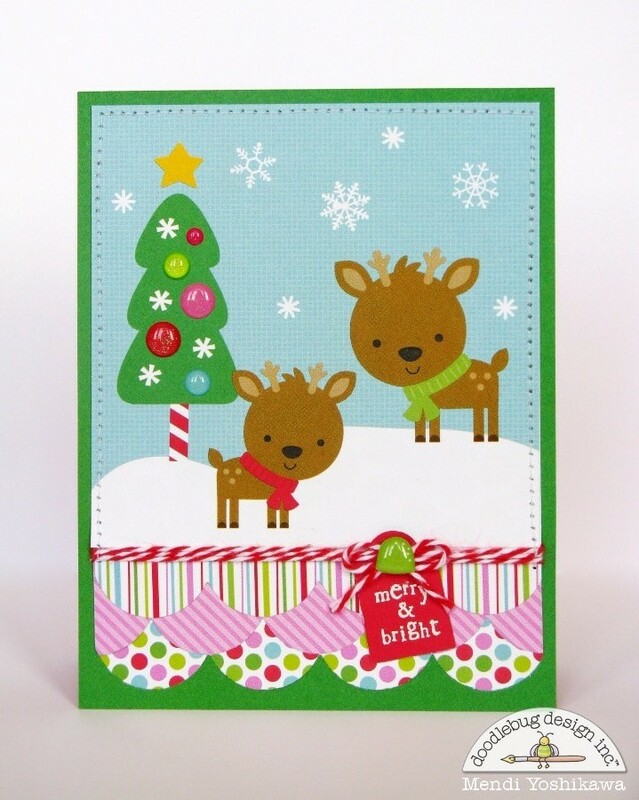 I am an Instagram follower and these are awesomely cute and very sweet holiday cards!!! Thanks to Mendi for sharing them with us!!! So full of fun items!